FAIRFIELD — Kathleen Falandys sat in her living room at the Pine Tree apartment complex. She’d just finished a physical therapy session — shaking her head she recalls how she fell retrieving some weights from a closet during an exercise class. “I wake up and say, ‘Who gets an opportunity like this,’” Falandys said, as visitors admired her tidy, one-bedroom apartment. Daughtry’s music fills the air, and a straw cowboy hat hangs nearby. Falandys is one of the original residents of the “old” Pine Tree, a complex of low brick buildings with 38 apartments, built for elderly and handicapped residents, owned and managed by the Fairfield Housing Authority along with the nearby Trefoil Court development. Nobody, she said, believes her when she says she has a vaulted, cathedral ceiling in her living room. The new $17.9 million complex, of which the first phase is complete, features two-story buildings, housing both one-bedroom and two-bedroom units. When the second phase is finished later this year, there will be 50 units. All residents from the original complex have returned, and some new residents, including families, have moved in. Housing Authority Director Carol Martin said the old housing model was not sustainable, with rentals limited to just the elderly and handicapped. So the decision was made to demolish the old complex and rebuild, this time opening up the housing to people based on income. There will also be five units set aside for referrals from Operation hope. At first, Martin said, some of the original tenants were not too keen on having families with young children in the development. Now that it’s happened, she said, the tenants seem to like the energy. With additional units available, the wait list was opened up, but only for 30 days. Even in that short time, Martin said, the 200 people sent in applications. The original complex was built in the late 60’s and early 70’s, and the dated development was made up of 11 buildings, with 20 efficiency units, and 18 one-bedroom units. The one bedroom units were 450 square feet. 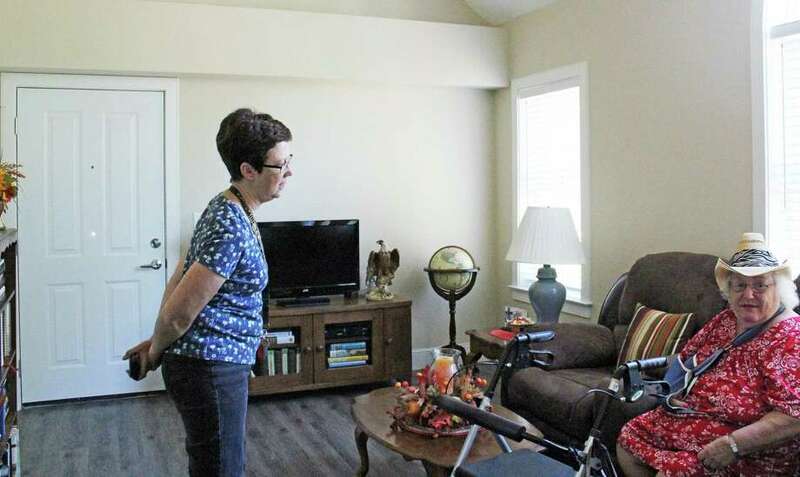 In the new buildings, a one-bedroom unit is 750 square feet, and a two-bedroom is 1,238 square feet. There were two washers and dryers located in the community building. In order to accommodate the demolition and construction, the original tenants were relocated to apartments throughout town. That was the job of Peggy Ford, the resident services coordinator. “They were anxious to get back,” she said. Ford and Martin speak in glowing terms of the architect, Paul Bailey, and of Haynes Construction, of Seymour. Completion of the complex was expected by the end of November, but now, it is expected all units will be occupied by then. The majority of the units are handicapped accessible, with walk-in showers. The kitchen and bathroom countertops are marble, and the appliances are energy-efficient. Vinyl plank flooring made to look like wood covers the floors, and each unit has its own washer and dryer. Residents got to have a say in the color choices, and there are some small, but important architectural details. For instance, end units have the vaulted living room ceilings, and the windows of the end units are different than those in the building its next to. The first floor units have a small patio in back. There are bike racks, and rain gardens at the complex, and the community building, which also houses offices for Martin and Ford, has a large patio for outdoor gatherings. The redevelopment was financed through low and no interest loans totaling $9.1 million from the Connecticut Housing Finance Authority, and $5.87 million in tax credit equity. The IRS gives certain corporations a tax write-off for 10 years for making investments in community housing construction. The equity financing came from Alden Financial. The Housing Authority also received a $175,000 loan from the developer.